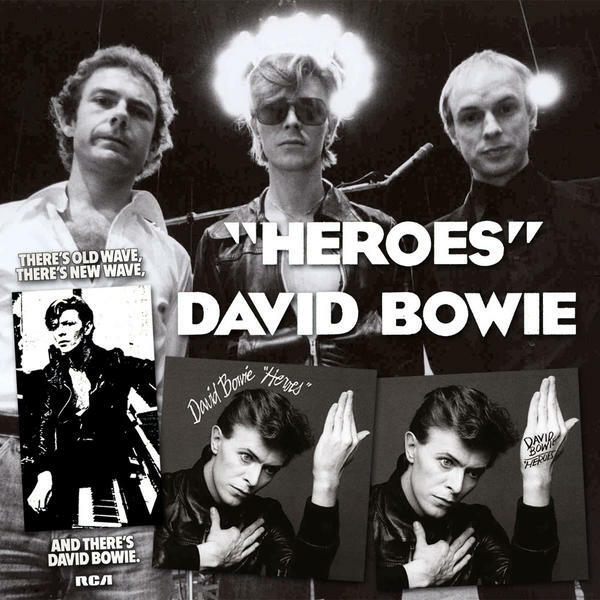 The advertising strapline ran with the legend: “Tomorrow Belongs To Those Who Can Hear It Coming”, appropriate considering how much more appreciated "Heroes" seems to be by a wider audience now than it was forty years ago. Having said that, the Bowie/Visconti-produced LP peaked at #3 in the UK album chart in November 1977, a year in which it was also named Album Of The Year in both NME and Melody Maker. No mean feat considering the other great music that was released that year, not least of all, both of Iggy Pop’s first solo releases, The Idiot and Lust For Life, two records which Bowie also had a very big hand in. The main image in our montage shows Robert Fripp, David Bowie and Brian Eno during the recording of "Heroes" at Hansa studios in Berlin, taken from the superb book accompanying the David Bowie: A New Career In A New Town (1977–1982) box set. Bottom right are two initial designs for "Heroes", also to be found in the book along with other unpublished artwork and related memorabilia.